The hostel is open, the boys are full of energy, evening satsang is full. The boys are back in town. Sometimes a story comes along that is really touching and makes one feel that something is going right in the school. 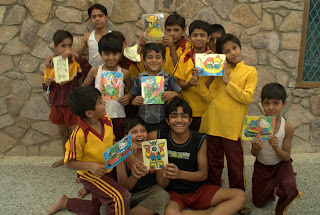 There is a group of students from a village about 90km from our Ashram. They just passed 10th class and want to continue to study. They have all got together with their parents and arranged to rent and stay in a house in the nearby town of Sojat so that they can have the chance to study 11th class in our school. I guess they could have chosen many places to do their study but the fact that they chose Jadan speaks volumes for the hard work which the teachers are doing. Today was the first day of the new school year. It is great to have the school come alive again with so many bright young faces.